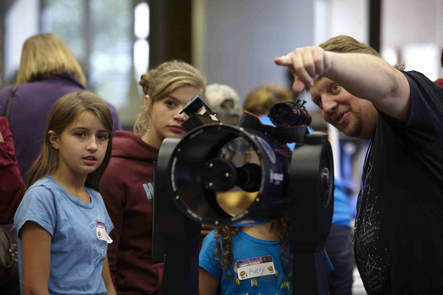 For many of our most devoted young fans Cool Science Carnival Day for Kids IS the festival! Carnival Day at UCCS (even though it wasn't called that yet) actually began in 2009, and was such a huge hit that it was a no-brainer when we decided to expand it the following year to create the multi-day celebration of all things STEAM (Science, Technology, Engineering, Art & Math) that we all enjoy now. Cool Science Carnival Day for Kids at UCCS is truly STEAM on steroids! We'll have exciting demonstration shows, talks, laboratory tours and demos, music, rockets, drones, animals, bugs, solar energy, telescopes & microscopes, rocks, fossils, a simulated cave, robots, electronics, virtual reality computers, a pop-up planetarium, an ambulance & fire engine, slime, an electric race car, liquid nitrogen ice cream & Dippin' Dots. You can even blend your own smoothie with electricity you generate by pedaling a cycle and lots of other fun hands-on STEAM activities and exhibits for kids (primarily K-8th grades). All of this is presented by Cool Science and dozens of participating companies, schools, museums, clubs, nonprofits and other organizations from throughout eastern Colorado. It's all FREE (including parking) and fun for all ages! Check out some photos from previous Carnival Days. Don't forget that Carnival Day is just the first of more than 60 great Colorado Springs Cool Science Festival events for all ages- bird and nature walks, cooking demonstrations, star gazing, pinball machines, story time for preschoolers, wine making, science trivia night, even a rare tour of an historic hydroelectric plant and much, much more! Check out the full 9-day schedule for more information. ​We still need lots of help to pull this off. Ask about volunteer opportunities for groups and individuals. Pre-Registration: Carnival Day is FREE, and it's not necessary to register, but it does help us to know how many people are coming, kid's ages and how you found our about the event, so if you have a couple minutes please pre-register online. Best Time to Come: We expect nearly 6,000 people to attend throughout the day, so it's always best to arrive earlier. Arrival: Our activities will be spread across much of the UCCS central main campus, inside and outside the University Center (UCTR), Centennial Hall (CENT), Engineering & Applied Science (ENGR) and Osborne Center (OCSE) (see campus map). We will have Information Tables with maps and volunteers to assist you at the main entrances to each of these buildings, but a good place to start is the lower University Center plaza on the east side of the El Pomar Center (EPC on the campus map). Food: It's going to be a long day of fun and exciting activities, so you may need to energize yourself. The Cafe 65 food court will be open from 10:30 am to 2 pm serving many different types of food, Clyde's serves pub food from 1 - 9 pm and Sanatorium Grounds coffee shop will be open until 1 pm. All are located in the University Center. Weather: We'll go rain or shine. If it is raining, snowing or extremely cold we will move many of the outside activities indoors. Social Media: Please post your comments and share your photos with us on our Carnival Day Facebook event page (and be sure to like us on our Facebook page too). You can also tweet to us @CScoolscience. Use the hashtag #CSCSF2018. T-Shirts: Remember this day all year with our official Cool Science Festival T-shirt (designed by Poloma at Pike's Peak Community College). 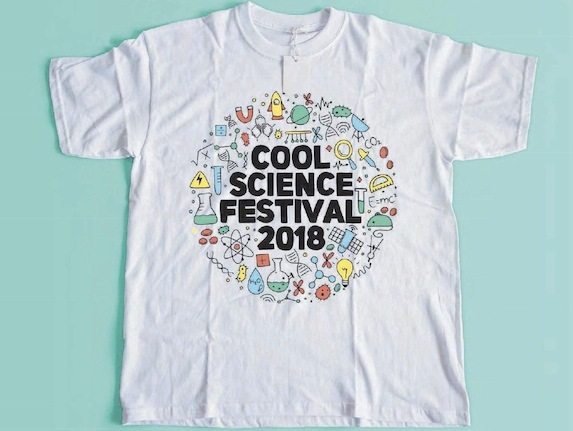 Children's and adult's sizes will be available at all Information Tables for a $15 donation to Cool Science (cash only). Black's Magic: "Magic Mission to Mars"
Master Magician Bruce Black blends comedy, magic and science principles to take students on an amazing magical journey to the Planet Mars (all ages, Centennial 203). Lori Bogren: "The Explosion Show"
She's back to demonstrate the explosive power of chemistry! Watch balloons go boom, blowtorches in beakers, and flaming gummy bears (all ages, outside Student Center upper plaza). Sean Bogren: "Colorado Springs FPV Drone Show"
Check out the state of the art in competitive racing drone aircraft. See them zoom across the sky and watch the live video from on-board cameras (all ages, outside lower plaza). Club Chess: "Chess - The Game of Kings"
Chess as you have never seen it before- complete with music, a suit of armor and the 2016/17 Colorado State Scholastic Chess Team Champions dressed in medieval costumes! Lots to see and do between shows as well (all ages, just inside Engineering & Applied Sciences building). 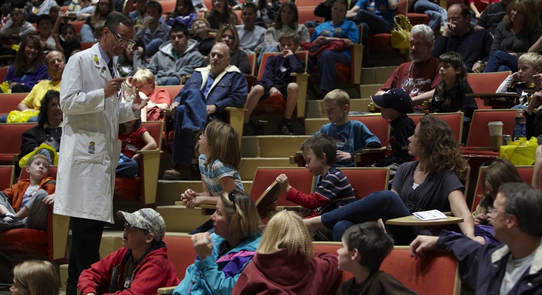 Always a fan favorite, experience the wonders of chemistry in our signature magic show for all ages (all ages, Centennial 203). Mark McGough: "Symmetries in Nature and Quantum Computing"
Mountain Lion Motorsports: "Electric Race Car"
Mountain Lion Motorsports, UCCS's own Formula Society of Automotive Engineers Electric (FSAEE) team will demonstrate some of the basic functionality of their prototype race car, talk about creating an electric race car, and discuss the future of electric cars (all ages, Osborne A301). Jim Paradise: "The Latest in Space Exploration"
NASA Space Ambassador Jim Paradise from Lockheed Martin will explain what's new and notable in space exploration (all ages, Centennial 203). Dan Sullivan: "Crime Scene Reconstruction"
Listen to stories about real cases as examples and learn how different types of scientists use technology to evaluate evidence and determine what really happened at the crime scene (grades 6-12, Centennial 188). UCCS Physics and Biofrontiers professors will demonstrate cutting edge biotechnology research (all ages, meet at Biofrontiers Activity Station inside Osborne main entrance near pendulum). Help scientists extract real DNA from strawberries and learn about the genetic building blocks that make up all life (grades 1-12, Osborne B314). UCCS Mechanical and Aerospace Engineering: "Computer Aided Design with Solidworks"
Watch a short demonstration of how computer software is used to create simulation models, then stay longer if you like to learn more and make your own model (grades 6-12, Osborne A216). UCCS Sustainability, Wellness & Learning (SWELL): "TrueFood for True Sport - Build Your Own Active Plate!" USAFA Physics: "Physics is Phun!" Watch a physics tour de force show featuring electricity, simple machines, a gravity-defying bicycle wheelm magnets and more. They'll even have liquid nitrogen and make Dippin' Dots! (all ages, Student Center room 303). Check out AEÃ˜RO amateur radio club's new emergency communications trailer and use the club's radios to talk to other 'hams' on several amateur radio bands. ​Learn how the central nervous system controls the body through this hands-on activity station. Look inside a real ambulance, watch CPR demonstrations, and talk with an EMT. ​Stretch your smelling power to help you identify different types of car and household fluids and learn about their applications. Once done, you'll be able to tell the difference between household fluids and automotive fluids based on how they smell and reactive to the environment. Demonstrations of solar power and thermal heating for all ages. Learn how the sun can provide us with renewable and powerful energy. Learn what a fungus has to do with the famous "Elephant Toothpaste" demonstration. Learn about the three categories of rock and how caves form. Suit up and crawl through a real simulated cave with a twist- the stalactites and stalagmites are electronic sensors so you will get a score when you're done. It's like you're inside a video game!. Enjoy a nature table with lots of bones, bird nests, feathers and more. Then try stamping leather to create your own personalized bracelet or trinket. Learn about the importance of hydration and nutrition for your body. Cut out your own paper rocket, add a nose cone and fins then use a compressed air launcher to blast off! ​Experience why the wildlife and fish native to Colorado are so important at this hands-on activity station. Win trivia prizes and get your questions answered by a real biologist. Safely observe the sun's surface and atmosphere- 93 million miles away- using our special filtered telescopes. It's more than just a yellow ball! ​Create a quality Estes Rocket Model that will take to the skies! Rocket Society members will be on stand-by to help with the construction and to answer any questions you may have on rockets. See real robots designed and built by high school students. You might even get to drive one though a designated course! Understand your body's amazing nervous system through visual displays and interactive learning activities. We'll scan your body with our IR thermography camera to show the temperatures in different locations and explain what it means. Watch our little "puppy pods" race around a mini hyperloop hi-tech transportation track. Produce electricity, listen to magnetism in action and use LEGO robots to serve lemonade! Experience signals in the sky with activities such as logic puzzles, an oscilloscope demonstration with musical instruments, an LED light show about digital signals and programming, hand-held (Dino-Lite) microscopes, and more! Build your own take-home spectroscope and use it to identify materials, just like NASA scientists do on the GOLD mission! ​Ride a rocket sled powered by your own human energy, try out some virtual reality goggles and learn about 3-D printing. ​Do you love cats? If so, then you'll love this activity station where you can learn about cat behavior and see how cats react to different stimuli. Learn about real construction materials and methods in this hands-on activity station with asphalt, concrete, and aggregate. Play with life-sized replicas of R2D2, BB8, and a mouse droid from Star Wars. Build mountains, rivers and lakes in our augmented reality (AR) sandbox, see what you look like in infrared (IR) wavelengths, and more. See our live honeybees and ask a beekeeper everything you ever wanted to know about bees and how to safely care for them. Enjoy fall and Halloween themed sensory actives that play with your touch, hearing, taste, smell, and vision! Shake, rattle, and roll as you learn about earthquakes! Little Bits and Makey Makey kits. Learn to use the Scratch programming language to interact with these devices to show how everyday objects can be used to control electronics and inventions. Watch a mycelium water filter and see how fungi can be used to filter harmful microbes and purify water. Use real lab and field equipment to examine rocks, minerals, and fossils. Middle and high school students will present their recent science fair projects and answer questions about the science the learned and why science fairs are valuable. ​Try your hand with some of the tools RMFI uses to keep our trails safe and clean. We'll also explain erosion and other environmental effects, and why sustainable trails are so important. Watch a 130 pound student-built robot in action. You can ask questions about robotics and even get a chance to drive the robot on yourself! Learn about dairy products while making your own tasty ice cream in less than 3 minutes using liquid nitrogen at -320°F. You're the engineer in the Imagination Playground, a collection of big blue foam blocks that can be used to build structures, sculptures and more. Play with a variety of toys that will teach you about science, technology, engineering, art, and math (STEAM). ​Explore the four forces of flight by testing which shapes fly the best in a wind tunnel- some hover, some fly out of the tube and others simply fall. Learn all about the importance of brushing and flossing your teeth with a variety of fun activities! Cook mini S'mores in a real solar oven. Learn about solar thermal principles and how the greenhouse effect impacts our environment. See cells under microscopes and giant insects in the Scanning Electron Microscope. Walk into the Global Portal where you can see and communicate with people in San Pedro Sula, Honduras from 10-noon, and Mexico City from 12-2. See how ammonia and dry ice create a rainbow of colors. We'll also use liquid nitrogen to freeze various items then smash them to pieces! Have fun learning about polymers by making slime, then turning soda pop into little spheres you can eat! The student chapter of the American Institute of Aeronautics and Astronautics will have Vex robots and other cool aerospace activities. Learn what the large Foucalt pendulum in the Osborne lobby shows and how it works. Meet a robotic child manikin from UCCS's Helen and Arthur E. Johnson Beth-El College of Nursing and Health Sciences Simulation Learning Center. It breathes, talks and you can even take its pulse and listen to its heartbeat with a stethoscope. You can also "drive" a telepresence robot located across campus. Play with mathematical concepts in fun and accessible ways, including Mobius bands, origami solids and explorations of probability. Compete in "Measurement Olympics" events using both standard and metric units for length, area, volume, perimeter and weight. Check out a real Army Humvee and meet the soldiers who operate and handle the military vehicle. Learn about civil engineering by designing and building several types of bridges with K'nex, then test to see if they'll handle the load. Thanks to all of our Cool Science volunteers and the participating organizations that make Carnival Day possible! Disclaimer: Please be aware that by attending this event, you consent to your likeness being used, without compensation, in photography for use in any and all media, whether known or subsequent. You release Cool Science, its successors, assigns and licensees from any liability whatsoever of any nature.